In our first post in this series, we covered passive acoustic tracking, a method of tracking marine animals. Another method we use to track animals through sound is active acoustic tracking. Active tracking can be likened to follow the leader, or a game of hide and seek. It differs from passive tracking because it relies on real-time listening and following the sound, rather than using a stationary receiver to record the information. It allows us to build a fine scale map of the animal’s movements and behaviours. Just as in passive acoustic tracking, active acoustic tracking also requires 2 components. A receiver, often with a hydrophone. 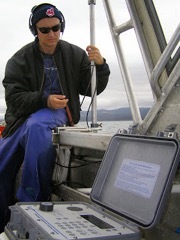 Adam Barnett listening to the pings emitted by the transmitter placed on a sevengill shark. Note the portable receiver built into the grey case. The transmitters (tags) come in a variety of sizes. The acoustic tag is attached to the animal and transmits a signal, or ping, at a pre-programmed rate (e.g. every second) at a set frequency. The portable receiver has a channel set for the given frequency, and using a hydrophone to listen for the sound, we carefully follow the tagged animal in a boat or kayak. As the animal moves, the sound changes in volume, indicating the changes in distance and direction of the animal. The researcher constantly swivels the hydrophone to find the strongest signal and continues to follow in that direction. As we track the sound, the portable receiver automatically records the position of our boat/kayak. This becomes the reflection of the animal’s track. The closer we can stick to the animal without influencing its movement, the more accurate our data is. This work is, in all honesty, exhausting, and after the first hour or so extremely boring. Animals can normally only be tracked for short periods of time in comparison to passive tracking, but very fine-scale movement data can be collected, and the detailed results can be quite exciting. When do we use active acoustic tracking? Active acoustic tracking is great for determining how an animal uses their habitat or learning about foraging behaviour. It can also give us a good idea of the use of space if we have no previous idea of where these animals get to. Actively tracking a few individuals from a species initially can also help in deciding the best acoustic array design for long term monitoring with passive acoustic systems. 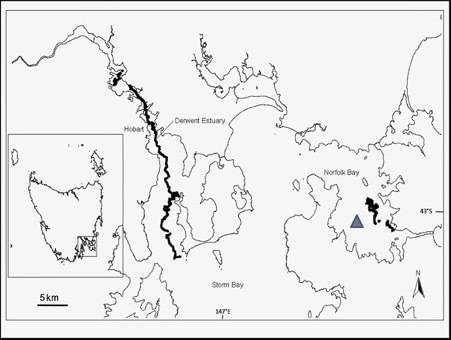 Below is an example of the tracks from two sevengill sharks in coastal areas of Tasmania. For this study, we attached the transmitters to the shark just behind the dorsal fin. The bold black lines are the tracks. While the shark in Norfolk Bay (far right) stayed in relatively the same area, the shark in the Derwent Estuary (left) travelled more than 37 km in 22 hours. Tags can also be programmed to send the depth the animal is at. These are pressure tags. The second graph below shows the depth the shark reached at different times during the track in the Derwent Estuary. 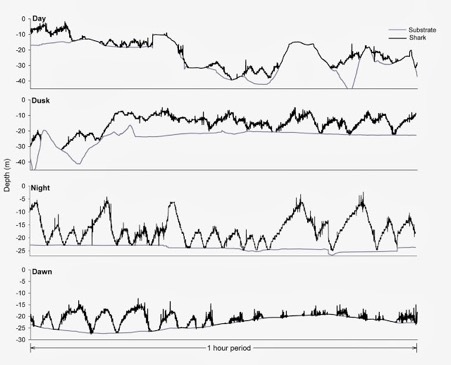 Note that during the day the sharks is close to the bottom, but at night it displays a yo-yo behaviour that could be associated with foraging. Click here to see the published paper.